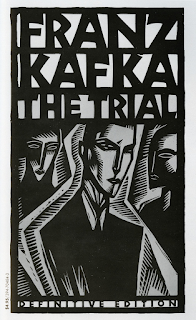 The Trial (1925), Der Proceß in the original German, is Franz Kafka’s claustrophobic story of one man fighting an unknown charge through a labyrinthine court system. On the morning of his thirtieth birthday, banker and bachelor Josef K. wakes to find his usual morning routine disrupted by two men who appear in his room and place him under arrest for an unspecified charge. It is a strange arrest not only for the lack of information but also for the lack of restraints it places on K.’s freedom, for he is allowed to go about his business without any obvious impediment while preparing to fight his case. As he embarks on a quest to identify the substance of the charge against him and to prove his innocence, K. is pulled through a court system whose processes are no less obscure than the nature of the charge laid against him and whose hearings take place in the attics of ordinary people. Unable either to contest or dispel his charge, K. becomes increasingly frustrated as he pursues one dead end after another, lawyers and advocates of the court repeatedly failing him and forcing his position into near stagnation. The reader follows K. as he flounders desperately in a world bereft of the crucial information that will shed light on his condition and shares his sense of hopeless inevitability as K.’s fate rolls slowly into view. Full of symbolism and laced with paranoia and helplessness, The Trial is a horror story of incontestable charges and the powerlessness of the individual. There are, broadly speaking, too ways of approaching The Trial as a novel: either by assuming that the events and characters described are projections of K.’s mind, or that everything is as described and external to K. Most readings will fall into one of these two camps, the former being a smaller, more intimate portrait of a mind coming apart, and the latter a larger, more political reading. Both approaches offer fertile ground for discussion and that the novel can be read in various different ways only adds to its sustained appeal. Although impossible to encapsulate all potential readings in a review, I will attempt here to give a flavour of some of the more common ideas about the novel. To take a literal approach firstly, The Trial can easily be read as a brilliant evocation of the totalitarian and authoritarian police states that scarred the twentieth century, before they had even come to prominence. In attempting to uncover the details of his crime, K. is shunted from one absurd bureaucratic process to another in a plot of circumlocution that exposes the power of self-sustaining organisations that have grown to serve little purpose other than to maintain their own existence. All information, all responsibility, is deferred and for K. it is impossible to get the centre of things, the substance at the heart of his case (also an indication of the metaphorical truth K. seeks). The complete power that the court system holds over K. while affording him no substantial information eerily foreshadows the totalitarian regimes that Orwell would later critique in Nineteen Eighty-Four. Kafka challenges the idea of the law as being just, and as being more than an abstract ideal but something that has an effect on the daily lives of members of society. The court which administers the law is run by humans and thus the application of justice is perverted by human failings. In all, Kafka’s conception of the law is a grim picture of corruption and unfeeling bureaucracy. Just as K. is given little to no information about his charge, neither is the reader. One thing that does become apparent through K.’s attempts to find out more about his case and contest the charges, however, is that K. is fairly promiscuous, taking every opportunity to seduce the women he encounters. As one of the few things the reader learns about K. through the course of the novel it would appear that this is significant. Yet, if innate sexuality is frowned upon by society then condemnation is, in effect, for the masses. It is possible, then, that K.’s charge in some way relates to his conduct, which might, hypocritically, be looked down upon by ‘polite society’. The novel paints, too, a rather dim view of city life and the modernising of society that, rather than improving life, has seen people grow apart, living in cramped spaces, their lives homogenised into a bland existence that appears to lack any significant measure of free will. For members of the society, policed by the court, a willingness to be absorbed into the whole is expected and any act of self-assertion is deemed unacceptable. K. therefore exists in a state of isolation from which he has no means of escape and is pulled increasingly into a state of inferiority and paranoia. Moving onto a more metaphorical approach, this state of paranoia allows for a psychoanalytical reading of the novel. It is on this level that the novel becomes increasingly interesting as it takes on metaphysical questions and explores a race that has outgrown religion. Like the existential novels that would become popular in the mid-twentieth century, it is possible to read The Trial as a search for the authentic self, and K.’s inability to navigate to the heart of the court is a representation of his failure to get to the centre of his own essence. Indeed, K.’s search for some objective truth is, ultimately, futile and K.’s inability to locate any firm basis to the world he inhabits is representative of the human life lived in a world without transcendent forces, without any untouchable doctrine that makes sense of the mess of existence. If the novel appears an allegory for the futility of life, then it certainly approaches one of the key questions that theology has wrangled with over that years: that is, if death is a sentence which all humanity shares, what charge condemns us all equally, and how best to deal with this inherited, inescapable guilt? Of course, the notion of guilt is an important aspect of K.’s story. For the reader, K.’s innocence cannot be assumed. For, while the charge is unknown, it can neither be accepted nor denied. In a godless world, there is no absolute measure of truth and so all guilt must be defined by laws created by human beings. This moral relativism may be part of the modern world sweeping across Kafka’s Europe, but the shackles of religion continued to ensure guilt was a more complex issue that for many people transcended the rule of Man. K.’s crime, one discovers, is in the nature of omissions rather than commissions. He has lived an isolated life with a heart that is cool and a soul that is unornamented by the pleasures of love, art, or a connection with nature. Even within the narrative, K. rejects opportunities to alleviate some of his suffering, a suggestion that he has not made the most of life. As his paranoia begins to riddle K. with self-doubt, he begins to assume the mantel of guilt, perhaps less deludedly than might first appear. Following the Calvanists’ conception of predestination, K. – like all humans – might be said to inherit a debt of guilt at birth (original sin), one from which the court process simply offers an opportunity for contrition. Similar to Job of the Old Testament, K.’s faith is put on trial but unlike Job, whose faith in God is unbroken, K. has no faith in the legal system that tries him. Calvanism, Protestantism, Catholicism, and Judaism all come under fire at different points in the story, and it becomes apparent that one can read The Trial as a parable for the development of Christianity in Europe. Unavoidably, there have been various biographical readings of the text too, prompted not least by the withholding of K.’s surname, which many have suggested is simply a stand in for Kafka’s own name. Certainly, if one were looking for autobiographical facts that would link Kafka and K. in a struggle against the opinions of society, it would not be difficult to turn some up. There are numerous reasons Kafka himself may have felt ostracised from society: his reclusive life as a writer, his position as a Jew in a society rife with anti-Semitism, the unconventional relationship he shared with Felice Bauer (for whom Fräulein Bürstner, a neighbour of K.’s is, apparently, a stand-in). In the novel, art is a way of organising reality that it makes sense. By extension, The Trial itself should be considered a piece of art that makes otherwise inaccessible truths clear to the reader. K.’s paranoia leads one into a mind suffering from a schizophrenic unreality, and K.’s own perception begins to confound. K.’s dream world seems almost to have seeped into his reality and everything is somehow off-kilter, the mundane transformed into something uncanny. In this way, Kafka makes the world unfamiliar and thus forces the reader to engage with it more fully. Yet, for a situation that sounds remarkably surreal in summary, The Trial actually has a texture far more realistic than one might expect. The ‘shady’ members of the court all seem but normal people going about their business with no inkling of being part of such an absurd plot. This aesthetic is a clear nod to more realistic concerns, specifically the unthinking complicity many people have in huge mechanisms of futility or cruelty. Similar to much of Kafka’s fiction, the novel starts with an unexpected and unwanted incursion into the life of its protagonist by a force or circumstance that will not be thrown off by the novel’s close. For Kafka, the moments when one wakes represent a volatile space between the dream world and reality – without the structures used to give reality its form it is a particularly dangerous space. Like K., the reader is thrown into a world of half-knowledge from the novel’s first line and never has the burden of ignorance alleviated. Kafka’s prose, while simple, brilliantly obfuscates the obvious. Information is carefully controlled and the reader is never allowed to get ahead of Josef K. in the investigation. The sheer lack of information given to K. or the reader means that The Trial resists interpretation using any familiar hermeneutic techniques. This again creates a mirror between the reader’s experience and the protagonist’s: K. studies the language of the court system fastidiously but cannot truly understand it, just as he fails to interpret artworks and others’ words at different times throughout the narrative. Certainly the gap between perception and knowledge is important and The Trial is a novel about the failure of narrative and as such the reader’s response to the text represents a part of its comment on the nature of language and reality. By necessity the plot is rather circular, with no real progress made. Dialogue can be frustratingly obtuse – again an exercise in obfuscation – which, while important to Kafka’s theme, can grate on the reader after a while. As K. finds new routes to discover the crime he has committed and how he might contest the charges only to be disappointed by one dead-end after another, so too the reader’s interest is maintained through these peaks and troughs of hope ignited only to be extinguished. However, when it becomes apparent that the frustration of K.’s position is never to be relieved, the reader may consider the repetitiveness of the story to become a little tedious. This is unavoidable in developing Kafka’s theme but it nonetheless becomes a little predictable on the story level. Unfinished at Kafka’s death, The Trial was later edited and readied for publication by his friend Max Brod, against the wishes of the author, who wanted the manuscript destroyed. As it was published posthumously from Kafka’s papers there is some debate about the order in which the chapters should appear and this only adds to the sense of things being out of kilter in the story. Taken as a whole, The Trial can be a disorienting read that realises the claustrophobia of both a society and a mind pressing in upon an individual. Kafka’s style owes a debt to Flaubert and Dostoevsky and equally foreshadows both the politics of totalitarianism and the philosophy of existentialism that would both rise to prominence in the mid-twentieth century. While not an entirely pleasing experience as a purely literary work, The Trial is undoubtedly a prescient and complex look at the individual in the twentieth century. Kafka's stories can be a little hard to get along with on some levels, and I don't think this is any different. K. somehow feels sub-human and the stories grinds a little, but on the level one should read The Trial it is richly satisfying. I prefer his short stories. Among the unfinished long works, Amerika is my favourite, rather than The Trial.